Pumpkin was not something I grew up with in the UK as my mum never really served pumpkin pie or pumpkin anything for that matter. It wasn’t until I moved to Canada and my mother-in-law served me pumpkin cheesecake that I was first time I was introduced to the unique flavour in a dessert. 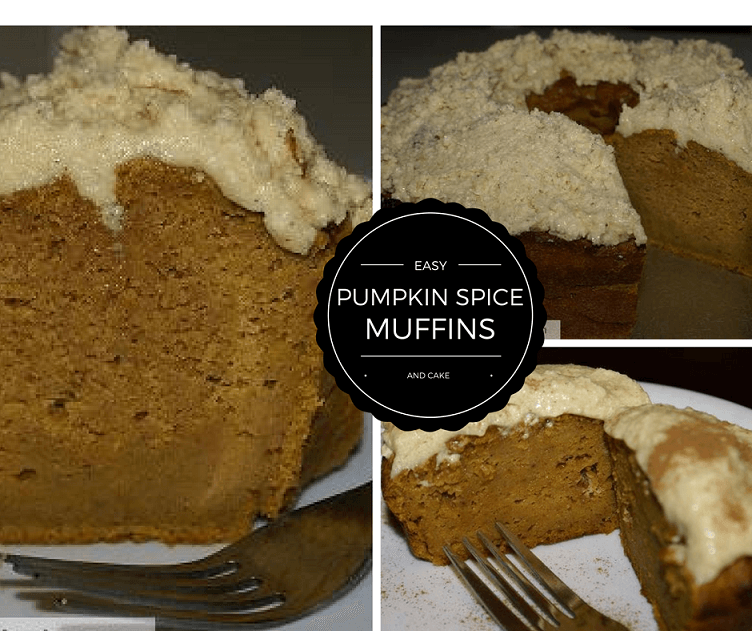 Over the years I tasted pumpkin pie, pumpkin scones,pumpkin cookies, pumpkin cheesecake and pumpkin bars all of which tempted me to create my pumpkin spice pound cake recipe this Fall. When the leaves begin to fall and the colours turn there’s something special about the Fall scenery, big bright orange pumpkins and warm Fall spices fill the air. We not only decorate the front of our house with pumpkins and corn stalks we now aim to create our own tradition for the season using this gourd-like squash better known as winter squash. Today I present to you a recipe that I created using pumpkin purée and seasonal spices such as nutmeg, pumpkin spice, cinnamon and all-spice. I created a rich buttery homemade pumpkin spice pound cake and topped it with a brown butter pumpkin spice butter-cream. I made this in a tube pan as well as a muffin tin but you could also use a bundt pan. You can make this recipe into pumpkin muffins simply by pouring them in a muffin tin like I did. Yield 12 Muffins. This homemade pound cake is sweet and spicy and tastes like you are biting into a nice thick piece of traditional pumpkin pie but without the crust. If you want your pumpkin pie fix without the crust this is your cake. It’s such a moist pound cake with the pumpkin purée you will have to stop yourself from eating more than one piece. Although the buttercream frosting lends just the right amount of sweetness you can enjoy this easy to make cake without any frosting at all. The bright orange colour is fancy enough to serve at any Traditional Thanksgiving or Fall Season gathering with friends or family. The cost to make this cake is around $7-10 but you can’t beat that for a fresh cake made with your own 2 hands. You know what ingredients you put in and you know that it will mean more to you than any store-bought cake (that’s if you can find one like this) This would also make a lovely gift or dessert if you are off to a dinner party. 3/4 cup of buttermilk **Note: If you do not have buttermilk you can make a buttermilk substitute** Simply add one teaspoon of white vinegar into a measuring cup then add milk until it reaches 1 cup. You will need the extra for the buttercream. Let stand about 5-15 minutes and it should curdle and will work the same as buttermilk. Bake at 350 degrees for about 55 minutes or until a toothpick is inserted and comes out clean. Muffins will take around 35 minutes. 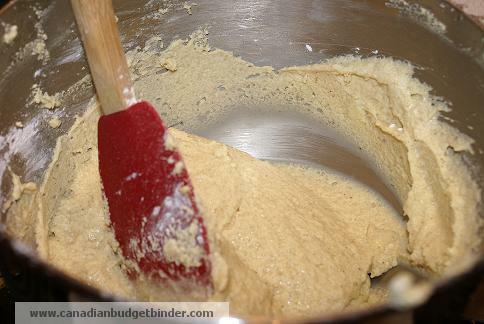 In a large bowl or mixer add the other half cup of butter and beat well then add in the brown butter and mix well. Add the sugar, vanilla, pumpkin purée juice and mix. Spread the buttercream on your cooled muffins or Pumpkin spice pound cake and sprinkle with cinnamon. You can serve this with a hot cup of coffee, tea or a nice big glass of cold milk. What recipes do you make with Pumpkin? You can find all of the Canadian Budget Binder Frugal Recipes in one spot on the blog in the Free Recipe Index. Please follow me on Twitter, Facebook and other popular social media using the links on the blog. You can also subscribe to Canadian Budget Binder so you don’t miss a blog post. Thanks for letting me know. I didn’t have a recipe plugin back when I started the blog. For the buttermilk take 6 tablespoons from the 3/4 cup for the buttercream icing and the rest is for the cake. I hope that helps. My family loves this cake because it tastes like pumpkin pie! I am in LOOOVE! This recipe is definitely on my list for Thanksgiving dinner – YUM! Ok, this just looks AWESOME. My wife made homemade pumpkin bars this weekend, I may have to pass this recipe on to her. Pumpkin Bars sound interesting. Was there cream cheese in them? I just gained 5 pounds looking at it. Thanks a lot! I’m going to have to try this one out, it is so perfectly timed! My spouse wanted pumpkin pie… and pumpkins were priced by the unit, so naturally the largest one possible came home. I bagged up over 14 cups of pumpkin to freeze last night! That’s after making two pies already…! I usually make loaf and cookies with it. Personally I don’t really care for the pie, but when it’s sitting on the counter I always manage to eat it, haha. This looks FABULOUS. I love, love love pumpkin. And the frosting..I’m drooling. Yum! I might not be able to get off the couch after that though – butter creams are sooooo rich! Brown sugar buttercream is hard to beat. I’m not a huge pumpkin fan, but I do like a little slice of pumpkin loaf with a cup of tea. Ok that buttercream frosting looks amazing. If you put your face up the screen and sniff I bet you can smell it… lol.. it was very nice! You should see the Tangerine Pound Cake I made today! Looks good. Couple of quick questions though. How much pumpkin would you think to use if you cooked your own pumpkin for this? From the size of the can I’d guess about two cups…. Does that sound about right to you? Also if I made up my own pumpkin spice mix I’m guessing around 2-2&1/2 teaspoons for the cake?? I’ve cooked my own pumpkin before, the only difference I found was the home cooked pumpkin was a little more watery so I drain it before using. I’d cook it much like you might do for regular squash, with a little water I the bottom of the pan and then just mash it good. A friend of mine and I used to cook up the jack-o-lanterns the day after Halloween for pies and such. We still laugh about it as her younger son will not eat pumpkin pie unless it is made from home cooked pumpkin. Even today it has to become cooked pumpkin or he won’t eat it. Must drive his wife batty, but his mother still cooks the pumpkin just for him!!!! Mind you she has been known to turn the air blue cutting those pumpkins up before cooking,,,, lol!! Yes it was about 2 cups of pumpkin. I would put in 2.5 teaspoons myself as it really won’t make a huge difference. I drained the juices from the pumpkin but I tell ya, this was just like a pumpkin pie.. How do you cook and prep the pumpkin? We’ve never done this but want to this year… we picked up our pumpkin today. I just cut it up and put it into a roasting pan with a little water……much like you would cook a squash, which is what pumpkin actually is.You can try to peel it before cooking or after, I’ve done both. Then I freeze it in quantities that work with the recipes I use. So in this case in about 2 cup lots. So if you don’t peel it do you just cook it then scoop it out?